A light bag with a stand is ideal if you carry your own clubs. There are light golf bags and there are heavy golf bags. There are bags that stand on their own, and then there are motorized ones that follow close behind you. You can pay as little as $10 or less, or as much a hundred times that much for a golf bag. Before you make that choice, there are things you should know about them. Do your homework before your buying trip, and you'll find the right golf bag for you. 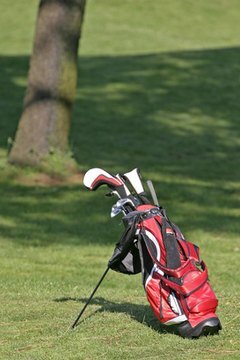 Decide before you shop about whether you intend to carry your own bag or you will put your bag on a cart or have a caddy carry your clubs. If you carry your own bag--and that is the most healthful way to play--you'll want it to hold your clubs and other accessories, but you'll want it to be as light as possible. The weight of your bag is only an issue if you tote your own clubs. Choose a golf bag that will carry all your belongings. If, for example, you carry rain gear, a second pair of golf shoes, a lot of golf balls, as well as a sandwich and a drink, you will need to buy a golf bag that will hold all those items. Understand, however, that the larger the bag, the more it will weigh. Decide if you intend to make a fashion statement with your golf bag. If you do, there is a slew of golf bags that are made of leather, and they reek elegance. They are also very expensive, often running $1,000 or more. Choose a bag that can close itself up and protect your clubs if you are taking trips. There are bags that do not need a separate carrier because they have a way to cover your clubs to protect them when you travel. Those bags cost a little more, but you will save having to buy another piece of golf equipment. Consider durability when you look for a new golf bag. Golf bags typify the axiom “You get what you pay for.” A cheap golf bag simply will not last long if you play a lot of golf. Consider a golf bag as a worthwhile investment, because one of good quality will last a long time.